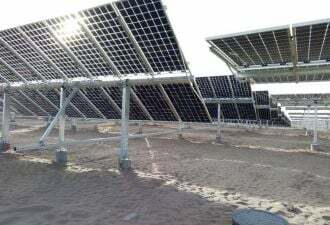 The Japanese solar firm has built a thin-film production line and is constructing another 480-megawatt factory for 2010. It also is testing concentrating-solar-power systems in Spain and Italy. Sharp Corp. began commercial production of its new thin-film solar production line in Japan this month and plans to ship panels to U.S. customers beginning in August. The company also is discussing contracts with undisclosed customers to develop solar-power plants for U.S. utilities, said Daisuke "Doug" Koshima, CEO and chairman of Sharp Electronics Corp., on Monday night at the Solar Power International conference in San Diego, Calif. The company recently completed a new 22 billion yen ($215 million) production line, located at an existing factory in Katsuragi, Japan, to bring the total capacity of the manufacturing thin-film cells to 160 megawatts per year – up from a previous capacity of 15 megawatts per year. Sharp expects to reach full capacity within four or five months, said Koshima, who became the head of Sharp Electronics in April. Cells made on the new production line will be made of glass, and will include a thin layer of amorphous silicon and another layer of microcrystalline silicon. The cells are assembled into panels for installations. Sharp executives declined to reveal the cost per watt of producing the cells or panels. Sharp entered the solar business nearly 50 years ago, making traditional crystalline-silicon-based panels, which make up the bulk of the solar market today. The company reigned as the largest solar cell producer in the world until last year, when German company Q-Cells took the title. The Japanese firm would like to win back that title by aggressively expanding its thin-film technology development and production. Thin-film panels have the potential to cost less than conventional crystalline panels, although they aren't as efficient at converting sunlight into electricity. Earlier this month, a Sharp executive said the company aims to win more than 50 percent of the thin-film market by 2012 and to increase its total thin-film production to 6 gigawatts as early as 2014, Bloomberg reported. The company said it expects the thin-film panels from its new Katsuragi factory to have 9 percent efficiency. Sharp also has been developing potentially more efficient triple-junction cells, which will have two layers of amorphous silicon and one layer of crystalline silicon. When the company first announced that it had developed ways to mass-produce the triple-junction cells in January 2007, it had said the cell would have an efficiency of 11 to 13 percent, resulting in a panel efficiency of 8.6 to 10 percent. Sharp said at the time that it would start mass-producing the triple-junction cells in the Katsuragi plant in May of 2007. The company now plans to make the triple-junction cells in a new factory in Sakai, Japan, starting in March of 2010, said Paul Wormser, senior director of product development and system solution at Sharp Electronics' solar energy solutions group. The 72 billion yen ($704 million) factory will have an initial production capacity of 480 megawatts, with room to expand to reach 1 gigawatt of capacity. Although Sharp executives steered the conversation to thin-film solar Monday night, they did say the company is already testing its concentrating-photovoltaic technology in Spain and Italy. The company won't be introducing commercial concentrating-solar products for a couple more years, Koshima said. Sharp showcased a prototype concentrating-solar panel at the Solar Power conference in San Jose two years ago. The company is developing a concentrating solar-power system that would include lenses made of glass and polymer, as well as gallium-arsenide solar cells that can get 35 percent efficiency when hit with sunlight that has been magnified 700 times, Wormser said. Concentrating-solar systems use less silicon than conventional solar panels. But some analysts don't expect the technology to grab a large share of the overall solar market because it is more expensive than traditional flat-plate solar technologies and doesn't have the advantage of being able to easily store energy as heat like solar-thermal technologies. It also requires more direct sunlight than conventional solar panels and trackers to help it follow the sun (see Which Concentrating Solar Companies are Doomed). In fact, the concentrating-photovoltaic market is expected to reach about 6 gigawatts by 2020, making up about 2 percent of the solar market, according to a Greentech Media and the Prometheus Institute report release in April (see Concentrating Solar to Reach 18 Gigawatts by 2020).